One of my favorite buildings in the village series is the Bedford Falls Train Station. As a building in the movie, it really only gets a single scene, but it's importance to the plot fingers its way into more than a few others. 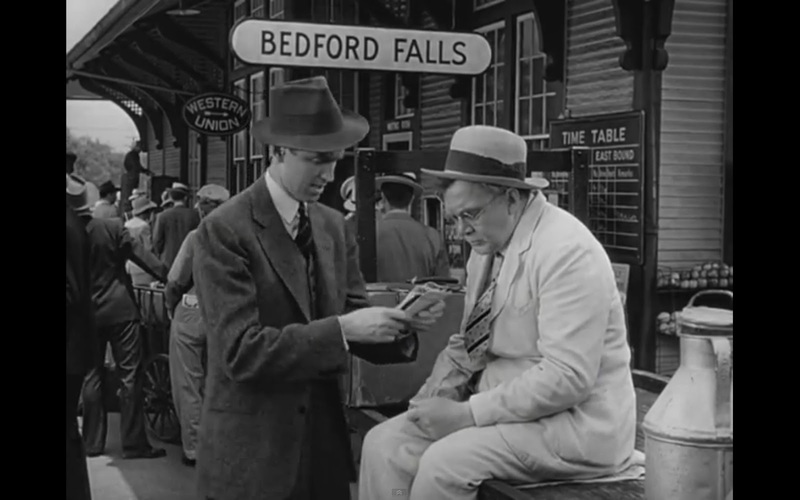 George's way out of Bedford Falls literally begins at the train station. 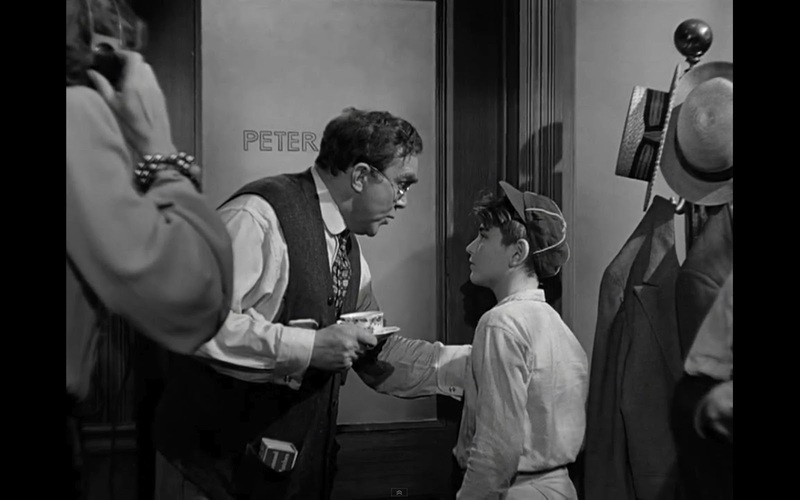 Several times we have to watch or hear about George being late for , missing, or wanting a train. Near the end of this post, are details of the actual station from real life. 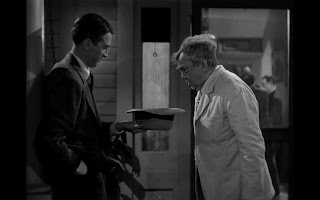 The film station is seen as Uncle Billy and George are waiting on Harry to return home. It seems to be pretty busy, and in the 30's and 40's train travel made up the large majority. An outside time table lists the west and east bound traffic and the station has the traditional Western Union telegram office it seems based on the sign from the background. Mr Gower must be somewhat close by or connected to the office, as it it he who in the end cables Sam Wainwright for the cash request. Side note alert! A fantastic film from the 40's that features Micky Rooney as well as Donna Reed along with the role of the telegraph office is the 1943 film, The Human Comedy. A young uncredited Robert Mitchum is in there as well. See Robert and beautiful Donna here to the left! It's talking to Uncle Billy at the station that we find out what George's favorite and most exciting sounds are, and unsurprisingly he lists "anchor chains, plane motors, and train whistles" . We see the visible impact these sounds can have on George later when he's speaking with his mother outside the house. As the train whistle goes off in the distance, we see George in all but physical form go with it. The look says it all. The station area is seen once more during the montage of war roles the various characters played during the conflict. Also at the station we meet for the first time, the newest Bailey in the film. Harry surprises his brother and family with a new wife. Ruth Dakin ... "Ruth Dakin Bailey if you don't mind!" It's her role, and especially her father that the hand of fate uses to continue keeping George in Bedford Falls. 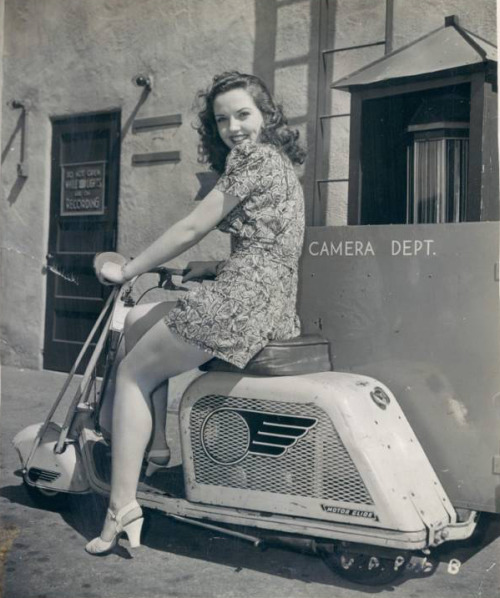 Ruth is played by the pretty and sweet Virginia Patton. Patton was a rising pretty face in the 40's. She played in a few roles before giving up acting to focus on her family after getting married. She's still with us and doing well, if this picture on her church's website is any indication. 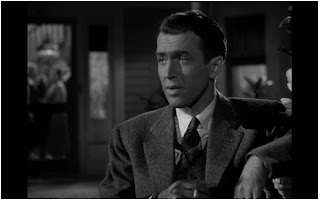 The Bedford Falls train station is another building and place that has special attachment to George and his desire to explore the world and see distant places. Mary presumably rides the train as she goes off to school and back, Harry of course is gone and out via the train, and even George's mother when sharing Harry's Medal of Honor dinner has been out of the town and riding the rails while George remains in Bedford Falls. I wish more of it could have been featured in the film. The real train station from It's a Wonderful Life. I had planned on detailing some information about the real station and the real building but found that someone had already done that. 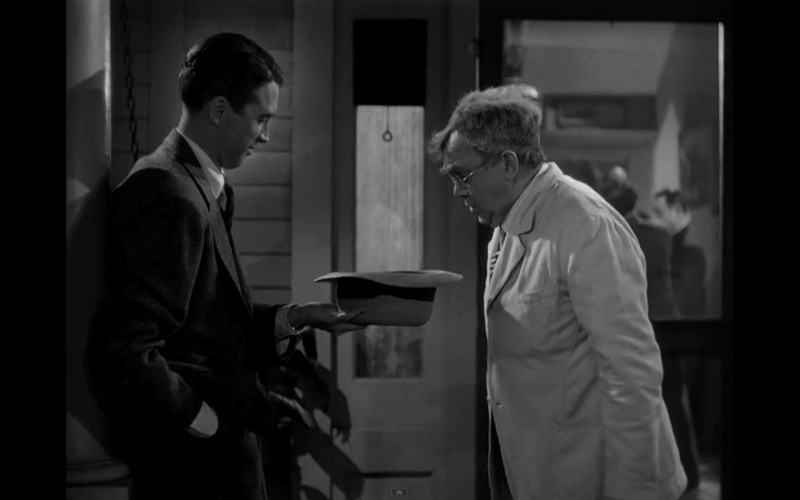 I encourage everyone to read this blog post about The real 'It's a Wonderful Life' train station! The real station used for the film was actually the Santa Fe Lamanda Park Train Station in Pasadena California. Lindsay has detailed the former location, the history of the filming, and provided some wonderful pictures concerning the station during the filming as well as its sad legacy by its demolition in 1953. Now concerning the Enesco village piece. A lot of good things can be said. The detail and the colors of this one are near the best of the series. I love the items around the station, and the great slant and sign on the roof. The baggage cart that Uncle Billy sits on in the film is here, but I wish they would have provided a few more accessories for the station and the train (which I'll review later on after the village buildings). Speaking of the bad scale seen on the Travel Agency, we see the contrast of that with this building. The doors and windows here are large and much better although judging by the village as a whole almost too big. The Enesco Bedford Falls Train Station is from the 3rd series, and is 2 of 4. Lets get to the village pictures! Enesco Bedford Falls Train Staion: Front face. Please click the 'Read More' below to continue with the other pictures. Enesco Bedford Falls Train Staion: Reverse face. Nice set layout picture of village to that time. Enesco Bedford Falls Train Staion: Top down. Enesco Bedford Falls Train Staion: Cert. This building is a bit different in that it's closely associated of course with the actual train. Thus, if you have the train and wish to use it ... the station needs to be set up in a position with the tracks. I do use the train, and try to place the station in a position on the outskirts of the village for the sake of room. I tend to make the Bridge and Train station the end points of my setup. Here are some shots of the building. Enesco Bedford Falls Train Staion: Front. Notice cart detail. Enesco Bedford Falls Train Staion: Sife view, notice roof angle. The Train Station lit up is of course very nice. The roof glows, the large windows cast good light. The simple yet pretty roof angle looks well compared to the myriad of flat slightly boring roofs of other buildings. COUSIN EUSTACE "(handing out cigars)Wedding cigars!" GEORGE "Oh-oh . . wedding! Holy mackerel, I'm married! Where's Mary? Mary. . .Poor Mary. Look, I've got a train to catch. (looks at his watch)Well, the train's gone. I wonder if Ernie's still here with his taxicab? COUSIN TILLY (on telephone) "George, there's a call for you." GEORGE "Look, will you get my wife on the phone? She's probably over ather mother's." COUSIN TILLY "Mrs. Bailey is on the phone." GEORGE "I don't want Mrs. Bailey. I want my wife. Mrs. Bailey! Oh, that's my wife! Here, I'll take it in here."